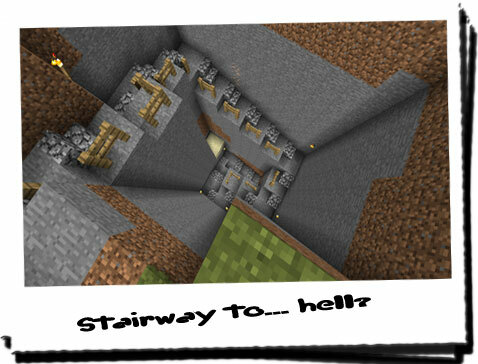 Diary of a Miner: Day 36: Went digging, found a stairway to hell! Today I awoke to strange surroundings; I was in a green tent, in a bed I was unfamiliar with and had a cow in my face! After the inital shock, I remembered where I was and managed to "persuade" the cow to leave! Today brought the inevitable digging for ages, and for the most part is was mostly doing just that! 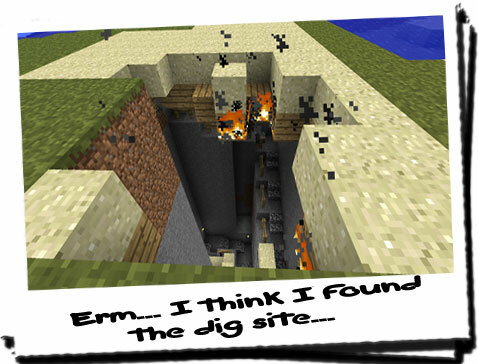 Well, digging and find stupid connections with nothing! I returned to the spot where I had left off digging yesterday, and began digging again! I took on the same routine as last time, and went about digging random holes in seemingly random locations. I can't say with any convidence how long I kept this up! But it was midday by the time I had a strange idea to revisit the forest again. 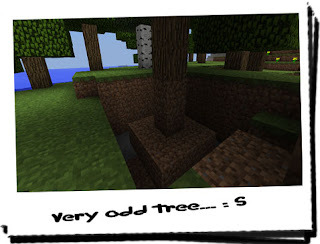 I don't know why, but I had a feeling this mystery involved that forest! The previous ten minute walk turned into an hour when I began digging at every "suspicious" patch of dirt and sand, only to realised it was just a bug... or a leaf! After getting there, I went around and inspected every tree, and every patch of earth under each tree for signs of a disturbance! 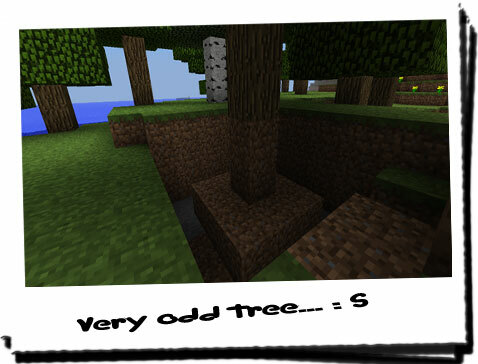 I didn't find anything suspicious at all, until I came to one tree which had no grass growing underneath it. Initially I suspected that the soil may have been put back into place, but after some digging around and generally making a mess of the roots, I found nothing, and decided to leave the tree in a rather precarious position! I returned to the tent, completely exhausted and rather frustrated at not getting anywhere! I decided to relax for a bit and have some fun with Chiron. At this rate, we'd be going back soon and he hadn't had much fun since we landed, what with me being busy. I'd taken the ball with me from the ship and brought it with us. I had a lot of fun with him for quite some time, until he got distracted by something in the sand... I initially thought he'd found a crab or a stranded fish or something, but he began digging and didn't stop until he disappeared! Eventually I noticed he'd gone, and went looking for him in the hole he had dug. I couldn't believe what I saw at the bottom of the hole; aside from Chiron sitting still, panting, he was sitting on wooden planks! I went back to the tent to retrieve my shovel and dug around a few more places close by to the same depth, and was met with wooden planks every time! Someone had put in a wooden barricade and placed sand on the top! No wonder I couldn't find any loose top soil, it had been buried under wood and sand! I took out my small flint lighter and attempted to start a fire; I didn't know how big the wooden barricade was and I wasn't really in the mood to dig around randomly to find out! 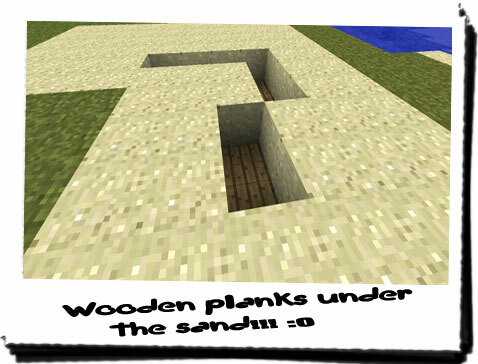 Instead, I hypothosised that as the wood burnt away, the sand would drop away, revealing the true size of the hole. That was obviously assuming there was a hole underneath, and nothing valuable that could get damaged! I decided to risk it, and took one of the duvets from the campbed and set fire to it! Placing it atop the wooden planks, I sat there and waited for the wood to burn and reveal the hole. After half an hour, I noticed small patches of sand falling away, but because of the flames, I couldn't get a decent look! I was worried about Chiron getting too close and hurting himself, so I took him away and went for a snack to calm him down. After another half an hour, I returned and saw something I hadn't quite expected in a "dig site"! I waited for the entire wooden platform to burn, and then stood in awe at the hole; had the crew really dug up all of this? 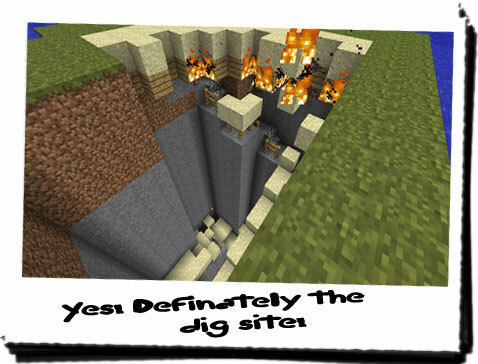 A four man crew had dug a huge hole expertly, with a stairway, wooden fences and found an entrance in a single dig? Maybe this "map" they referred to was very specific about the instructions! I returned from above the spring and searched the corner into which the water poured, but still found nothing! I returned to the junction and decided to go the other way, but was instantly met with another wooden barricade! It was like there was someone trying to keep other people out! 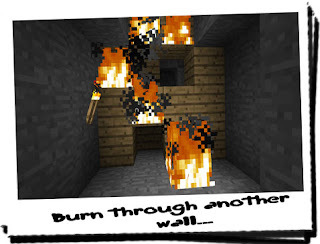 But to a keen adventurer who had a flint lighter, it would take more than a wooden barricade to stop me! 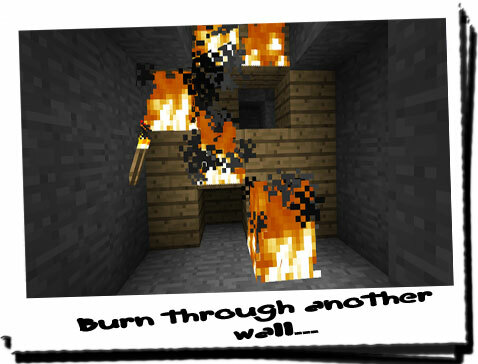 I quickly set fire to it, making short work of the new wooden planks. After a few minutes of continous burning, I was shocked at what I saw! I stood before a small hole in the ground with a wooden staircase descending into it, with a single torch placed above it! I put my flint lighter away and readied my sword! I descended the staircase, not knowing what to expect, but ready to tackle anything. After all, I had the advantage! The staircase went round in circles for some time, going around a single stone pillar that presumably went down quite far! After about ten minutes of descending, I noticed a small notch in the wall and decided to break it down! What with the entire staircase being made from wood, I saw the flint lighter as a bad option! The wooden planks were weak in comparison to my sword and it made short work of them. Behind the wooden planks was something I had expected, but posed no form of mystery or intrigue to me at all! 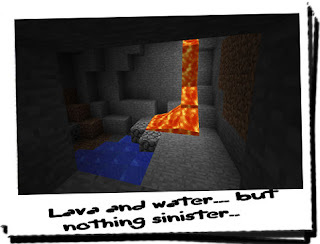 I entered the small chamber and searched everywhere, paying careful attention to the lava! There was nothing in this room; no wood to suggest another entrance, no hint of human life, no tool markings on anything! This cavern seemed to have been stumbled upon and then boarded up! I continued down the staircase which seemed to go on forever! I don't know how long I was descending, but I was getting out of breath pretty quickly! Eventually it levelled off, and the wooden staircase stopped! But there was nothing of interest here at all! I had wasted who-knows how much time descending into pure boredom! I began to ascend the staircase again and it was then that I noticed something odd: there was tons of ore on the surface of the walls, fully exposed for excavation, and it hadn't been touched! Why would a crew so obviously good at mining ignore valuable ore? It was everywhere, ranging from standard coal up to iron and gold! 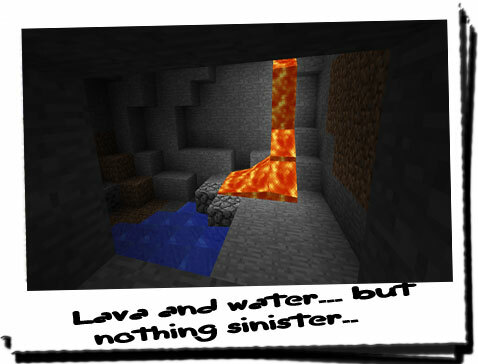 There was masses of redstone in the strange cavern with the lava and water, but no-one had even attempted to mine it! After what seemed like an eternity, I got back to the surface of the wooden staircase! I was quite exhausted by now, and I couldn't see anything else to suggest anyone was here! The only option left to me was to do what I had done initially: dig in seemingly random places! I wasn't ready for that today though! I started back up the stairway back to the surface, when I noticed it was almost pitch black outside. I hadn't realised that I'd spent so much time down there, it seemed impossible in fact! But I couldn't argue with the sight of the sun slipping below the horizon, so I decided to turn in for the night! I went back to the tent, being greeted by Chiron and began searching for anything else that might help me uncover what was going on here! I found a few spare sticks of dynamite lodged between the tent wall and one of the campbeds! I don't know whether it has any use, but it was odd to find it there... I've put it somewhere more accessible and am still looking for any sign of that map, although I've pretty much consoled myself to the fact that they took it with them... I still don't get the diary entry about references to TNT being used! I went throughout the entire area and didn't find any sign suggesting heavy demolitions! This either meant I've found the wrong site, or I haven't got to it yet... In either case, it had me intrigued enough to stay until at least the end of tomorrow.